Knowing how to handle and prepare tofu is still a puzzlement to many people. It doesn’t have to be that way. This blog will show you how easy it is to put together a tasty tofu dish, even if you’ve never made one before. Tofu (plain tofu) is gluten free, has only 70 calories in each 3 oz. serving, and is an excellent source of vegetable protein (8 g). One portion contains 6% RDA of iron and 15 % RDA of calcium. Tofu is naturally cholesterol free and bland tasting. A trick to pack it with flavor is to combine it with lots of herbs, spices, vegetables, and seasonings. Sprinkle on spices like chili powder, oregano, or paprika generously to assure your taste buds sing. I offer tofu tips and recipe suggestions, especially for those who want an awesome change-of-pace meal, or are moving toward a more plant-based lifestyle. 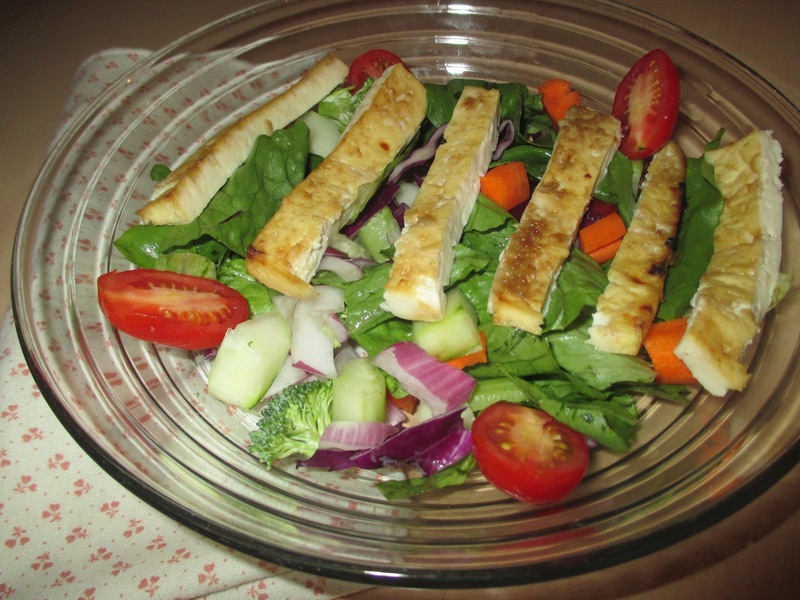 Read on to discover how economical, fun, and easy it can be to prepare tofu dishes you and your family will enjoy. Follow your customary recipe, but instead of using ricotta cheese, use organic silken or organic soft tofu for half or all the ricotta cheese. Top with grated organic soy cheese instead of Parmesan. Add pureed, highly seasoned organic tofu or spicy cubed organic tofu to traditional fare to stretch a recipe and be kind to your pocketbook. Substitute crumpled tofu with added spices and herbs for chopped beef, poultry, or dairy in recipes to reduce cholesterol without losing taste. Mix chopped firm organic tofu with Sloppy Joe sauce, BBQ, or Old Bay seasoning. Blend equal amounts of organic tofu with canned tuna or crab meat, boiled eggs (use whites only for lower cholesterol), or combine tofu and paprika mashed garbanzo beans. Then enjoy. When making sandwiches, remember to use whole grain roll or bread. One of the secrets of improving the texture of water packed tofu and heightening its taste is to remove all excess water. Place a brick of firm or extra firm organic tofu on a plate. 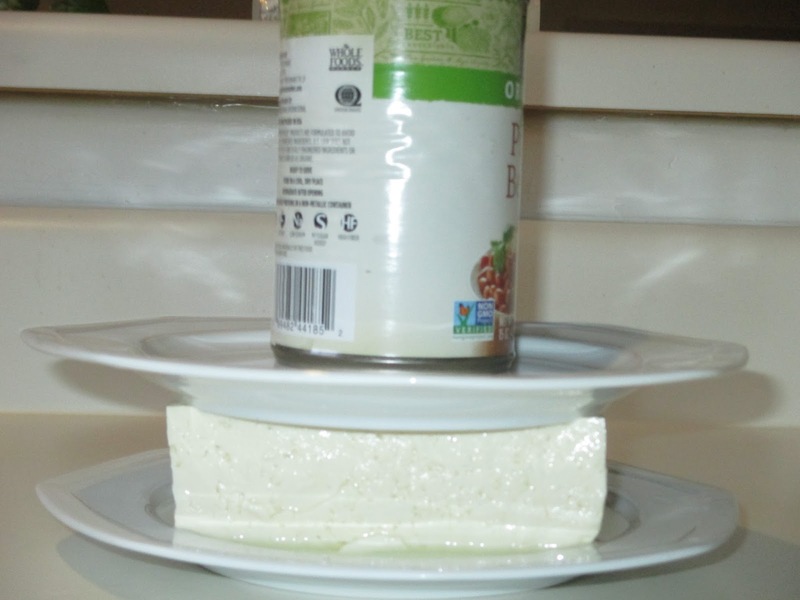 Cover tofu with another plate and place a weight such as a large can on top of all. Refrigerate for at least one half hour. When you're ready to begin, pour off liquid and follow your recipe. Water-packed organic tofu can be found in the dairy, produce, or Asian food case of your supermarket or health food store. It also is offered for sale in aseptically wrapped packages. This form of tofu doesn't need to be refrigerated before opening, has a long shelf life, and is already drained. Prices for organic tofu list from $1.99-$2.50 lb. Figure a portion at 3-4 oz. of tofu per person. How's that for good value? Ta-dah! Now, on to my recipe. This recipe requires advance prep time, but the actual cooking time is only 6 minutes. Early in the day, set up the tofu to drain as shown here and refrigerate. After a half hour or when all the water is drained out of the tofu, slice it into ½ in. slices. Place the tofu in a large container (one where you can lay the tofu slices out flat without overlap). In a small mixing bowl, blend all the remaining ingredients together to make a marinade. 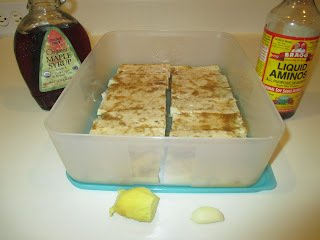 Use a pastry brush or spoon to coat pieces of tofu with marinade, cover container, and refrigerate for one hour or more. The longer tofu marinates, the tastier it gets. When you're ready to broil the sliced tofu, put it in a broiling pan. Use a pastry brush or spoon to coat the surface of the tofu with the extra marinade left in the container. Broil 3 minutes on each side or until the tofu is lightly browned. serves 4-6 hearty eaters, depending on what foods you serve with it. top of a tossed salad for a quick energy lunch (pictured at the top). Another idea is to put a few slices of tofu on rye bread, add sauerkraut and mustard, and you have a tasty sandwich. IMPORTANT INFORMATION: In the United States, almost all tofu that is not marked non-GMO or organic is genetically modified. Genetically Modified seeds have their genes manipulated, changed, and put into other species that normally they would not grow in. Incredible results have been produced. Some include mutations, diseases, abnormalities and trigger other diseases that otherwise may have remained dormant. Little testing has been done on the health effects of humans ingesting and using genetically modified products. Tests that have been done on animals that naturally refuse to eat Genetically Modified feed, but are being force-fed the Genetically Modified feed, develop lesions, abnormalities, disease…and some have died. Following is information from Green America about soy products. I have obtained permission to quote them. Do you already make tofu part of your eating plan? 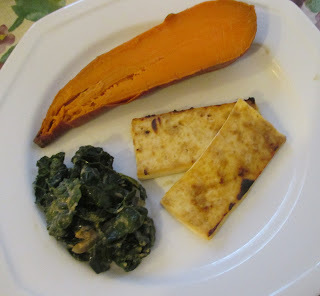 If you have a favorite recipe or tofu tips, won't you share it with my readers and me? Comment in the area provided below please. Spreading the word about this post on social media is greatly appreciated! The past three days leading up to Labor Day has been an opportunity for me to reflect about the importance of “work” in my life and how purposeful activity has bettered me. Perhaps you know that in addition to my being a Wellness Blogger, I am a Health & Lifestyle Writer, Author of Colors of Joy: A Woman’s Guide for Self-Discovery, Balance, and Bliss, and Independent Publisher at Align Publishing LLC. Many years of toil, persistence, and patience with myself and my learning curve has taught me much. I have a strong work ethic and do my utmost to create interesting content that features ideas and tips to enhance the quality of your life. 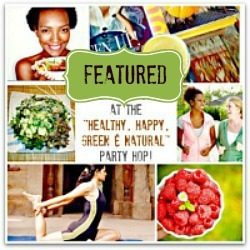 I’m enthusiastic about the topics I choose to share with you. The writing process makes me happy, and today I savor my process as much as I do the bounty of my efforts. I’m grateful I continue to feel excited about learning new things. My next project is to increase my technological ability in order to expand my audience and touch more people with my words. My goal is to be of service to others and stimulate thinking about health issues, wellness topics, food and recipe information, travel gems, book recommendations, writing tips, environmental issues, and relationship and self-care skills. On this Labor Day, I pause to honor all workers who live in our great nation. I encourage you to do your best every day, whether you are an entrepreneur or work for someone else. Be conscientious and go that extra mile whenever you can. Take my word for it. It's worth it. You're sure to gain proficiency, have more self-confidence, feel gratification for the effort you put in, and even may be noticed and promoted. If you don't feel good about your current occupation, or feel under-appreciated or under-paid, recognize it as a sign that your self-esteem is lagging, you need to speak up for yourself, and/or it’s time to move on. 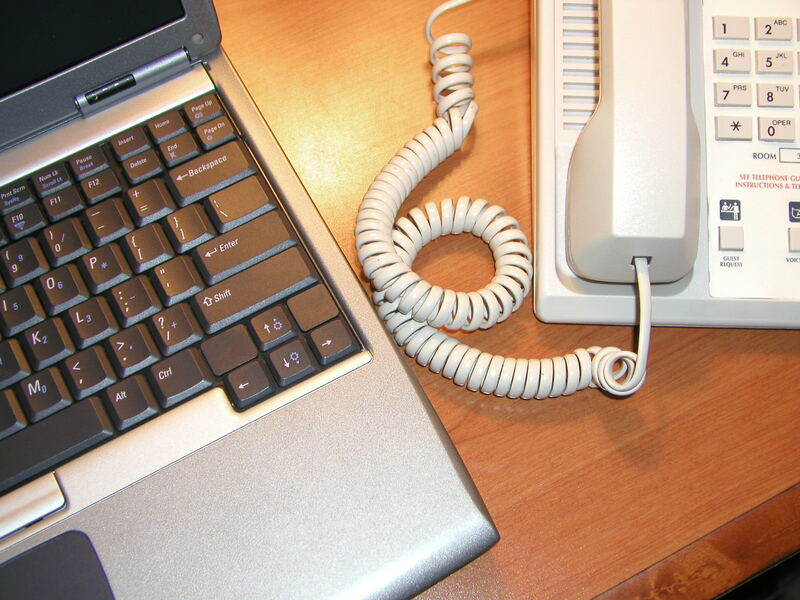 Before you take this step, it’s best to have another job lined up. If you want to shift gears, and need additional schooling to prepare, have the courage to go for it. Another good way to investigate a new career is to speak with those who already do this job. Why not volunteer in a field that you are considering and see whether it is a good match for you? At the very least, you'll find out what skills are required in that position, meet contacts, and learn what leadership qualities make people in this role stand out in a competitive market. Be daring! Let your unique talents and gifts shine. Cultivate them on your career path and your spirit will dance. Everyone has something that is special about themselves. I believe our life purpose is to discover what that means for us. On Labor Day I especially want to salute all those who are raising or have raised children. Your job is extremely valuable and challenging , and many of you also maintain your household, serve in the military, and/or are our bus drivers, police, waiters, teachers, technicians, shop owners, and the countless others who are part of the work force. Whatever your job may be, do it well! 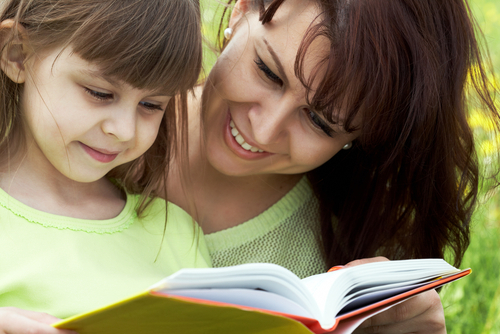 Kids learn from our guidance and the example we set. What do you value about your work? What challenges and growth has occurred as a result? What self-care techniques help you function well on the job and in your down time? Please comment below. Then share the love on social media. I'd love for you to become a Google+ follower. That way you'll get an update automatically (about twice a month), when I post.